Synopsis: It is the autumn of 1367. Master Hugh is enjoying the peaceful life of Bampton, when a badly beaten man is found under the porch of St. Andrew's Chapel. The dying man is a chapman -- a traveling merchant. Before he is buried in the chapel grounds an ancient, corroded coin is found in the man's mouth. Master Hugh's quest for the chapman's assailants, and his search for the origin of the coin, makes steady progress – but there are men of wealth and power who wish to halt his search, and an old nemesis, Sir Simon Trillowe, is in league with them. But Master Hugh, and his assistant, the groom Arthur, are determined to uncover the thieves and murderers, and the source of the chapman's coin. 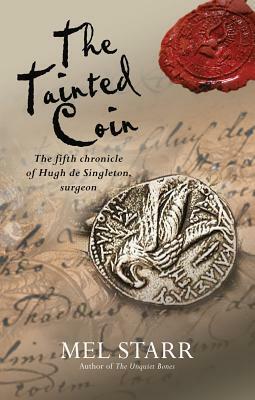 They do, but not before they become involved with a kidnapped maiden, a tyrannical abbot, and a suffering monk – who needs Master Hugh's surgical skills and in return provides clues which assist Hugh in solving the mystery of the tainted coin. Review: Another interesting installment in the Hugh de Singleton series, this mystery will have you guessing until the end. Brilliantly written, you won't want to put this down!